The Mighty Oak have teamed up with the Jim Toy Community Center for the second straight year to raise funds and amplify the message of inclusiveness. 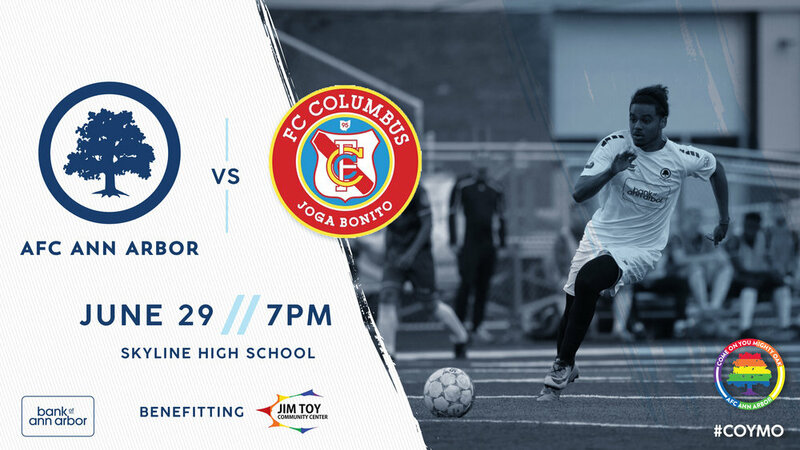 The partnership includes proceeds from a special edition AFCAA Pride shirt as well as tickets sales from the June 29th match versus FC Indiana to benefit the Jim Toy Community Center. Fans can pre-order their 2018 AFC Ann Arbor pride shirt and pick it up at the June 29th match or have it shipped direct on June 25th. Twenty-five percent of all sales will be donated to the Jim Toy Community Center. Newly appointed LGBTQ liaison to the Mayor’s Office, Travis Radina, is also the President of the JTCC and a multi-year member of the AFCAA Family. Radina values this partnership for both its financial impact and beyond. “While this partnership helps raise critical funds to carry out JTCC’s mission, the most important part of this partnership is that AFC Ann Arbor is doing its part to ensure that Ann Arbor is an inclusive community where people of diverse sexual orientation and gender identity are visible and live together in equality, respect and happiness,” said Radina. To learn more about the Jim Toy Community Center, click here. Buy tickets here.